FriLight Sun 8311 plastic boat light fixture with 12 Volt Halogen/Xenon and 12-24 Volt LED G4-Pin bulb choices. 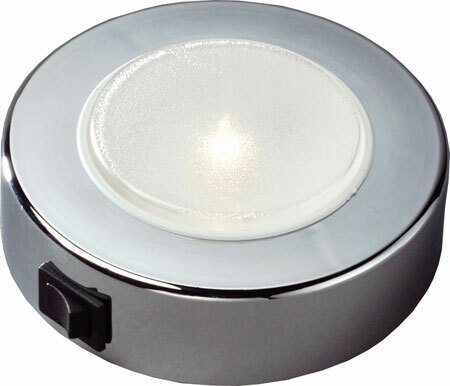 Frosted lens, side mounted rocker switch and range of options for finish style and LED color. G4 socket LED bulb is an energy efficient 12 SMD Bulb. This LED is able to function on an input of 10-30 volts DC. 160 Lumen Warm White, 190 Lumen Cool White, 197 Lumen CLOSEOUT Warm White, 240 Lumen CLOSEOUT Cool White, Blue, Red, Red/Warm White bi-color bulb or Blue/Warm White bi-color bulb. Bi-color bulb options offer a full-brightness Warm White LED in addition to a secondary option.